Real Estate Holding company with portfolio of Brokerage Brands. Shares price tumbled to lows on pessimistic views of US Housing. Near 52 week low and oversold due to improving market fundamentals. Realogy Holding Corp (RLGY) is a leading integrated provider of residential real-estate services in the U.S. Realogy's fully integrated business model includes brokerage, franchising, relocation, mortgage, and title and settlement services. Since the beginning of 2018, industry pressures have helped RLGY to lose 52% of its value, falling from $26.42. Year to Date, RLGY was up c. 25% to $18 until just before their Q4 conference Call. The call was followed by Downgrades and a sell off as the stock tumbled 39% to a low of $10.92 towards the end of March. The stock has since appreciated by 17% to $12.82 on the back of renewed optimism. We see further upside on this name following better than expected Q1 2019 results due to eased macroeconomic pressures and the development of the firms strategic initiatives. Q4 2018 was tough for participants in the Real Estate market as Q4 transaction volume and December transaction volume were down by 4% and 10%, respectively. Many, including RLGY management, expected that this downturn would continue into 2019 before easing in H2. The issue for RLGY is that, like most others in the space, their earnings are highly correlated with national transaction volumes and Prices. As the charts below show, where the market goes, RLGY follows. Investors and market participants expected depressed market conditions coming into 2019, due to prevailing market conditions at the end of 2018 and management commentary during the Q4 conference call (below). However, we believe that RLGY has a strong chance of meeting or even beating consensus for Q1 2019. Management have stated that the main reasons for the declining Transaction Volumes are “constrained inventory, as well as reduced affordability due to higher average homesale prices and rising mortgage rates”. Inventory has been declining for many years, especially over FY2018. As, CFO Anthony Hull remarked in Q3's conference call, "for three quarters in a row [inventory] is by far the biggest issue." There are signs that this pressure may be easing early in 2019. For the first time in many years the market saw growth on an annual basis in housing inventory over the last few months. The measure has grown in four of the past five months. 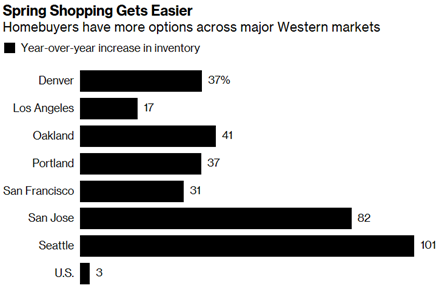 Bloomberg surmise the increase in inventory is down to the most buyers being priced out after the prolonged period of rising prices. The increase in inventory should ease house price pressure, which in turn will increase transaction volumes. Affordability is key for RLGY to realise high transaction volumes. 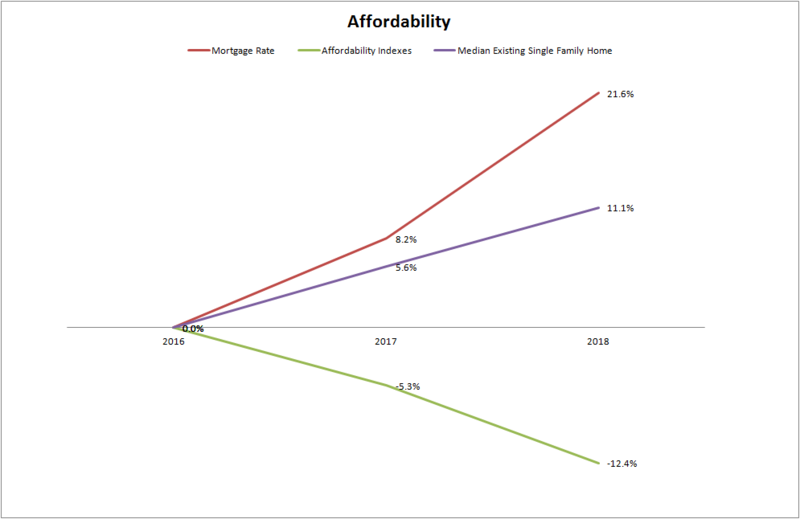 Affordability can be gauged looking at Mortgage Rates and Median House Prices. The affordability index fell to a low of 140.3 in July 2018 as homebuyers were feeling the strain of rising mortgage rates, which made borrowing for purchases more expensive, while at the same time contending with rising house prices. These two trends over the last few years have had the effect of pricing many would-be-buyers out of the market. This trend was expected to continue into 2019. George Ratiu of NAR (director of quantitative and commercial research) commented late last year that “Affordability will continue declining in 2019…[as] prices and interest rates are expected to increase." The fall in house prices from July 2018 helped to start the rebound in affordability, this rebound really picked up in the new year, following the drop in mortgage rates. 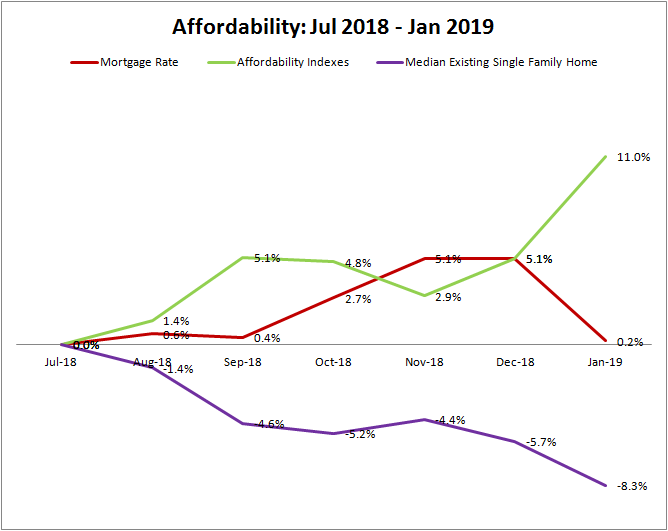 The affordability index increased from 147.4 to 155.8 in January 2019. This is due to the lower mortgage rates (4.99% vs 4.76%) caused by the dovish FED commentary that made rate hikes in 2019 seem less probable. It is very likely that the Fed will keep rates lower for longer which could mean a surge in home building, further propping up inventories. The increasing affordability helped to force a surge in Monthly transactions in February. According to the NAR, Existing-home sales rebounded strongly in February, experiencing the largest month-over-month gain since December 2015. Given RLGYs earnings correlation to the market, we see these as positive signs for their Q1. Realogy most also contend with external and internal pressures from both their direct competitors and their agents. The competitive environment is ever intensifying. Traditional brokerage brands have been directing their efforts at recruiting more agents to gain market share. In addition, new competitors form on a regular basis to try and disrupt the industry using technology. Zillow and their drive to 'Uberize' transactions are a great example of this form of disruption. There also firms like iBuyer that takes principal risk via electronic property transactions. Given that the next big bracket of consumer belong to the millennial group, this form of disruption has a good chance of mass penetration. Another significant headwind concerns commission splits with agents. The aforementioned push by traditional brokerages to grow their base of agents has continued to put pressure on commission splits. Agent commission splits have been increasingly favorable to the agents over the last few years. 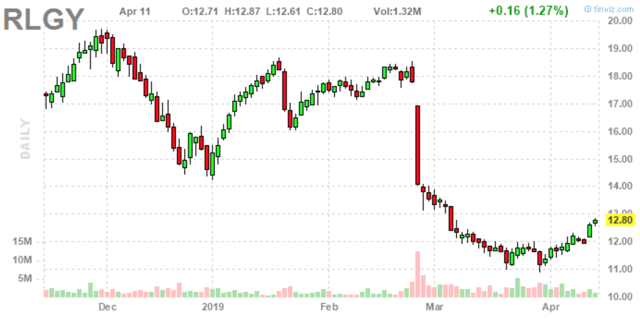 These external and internal headwinds have had the effect of pressuring Realogy's on the topline as well as squeezing their margins. For FY2018, RLGYs EBITDA came in short $74m of 2017s and stands at $658m. To put the commission costs issue into perspective, they had a significant impact on EBITDA in FY2018 as commission costs increased by $52m, 70% of the EBITDA slowdown. The firm is effectively being attacked from both ends. Management have highlighted strategic initiatives to attack these issues buck industry trends as they shoot for above market returns to gain market share. During Q4's conference, Ryan Shneider gave a clear indication of how these headwinds interact and how management think about mitigants. In the past, RLGY had been able to mitigate the higher agent costs with higher volumes. They estimate that 30 basis points of upward pressure on commissions can be offset by 1 basis point of volume. Since RLGY cannot rely on natural volume growth in 2019, they have initiated strategies to drive transaction growth. This includes growing their base of agents and providing them with a) first class technologies, tools and support, and b) devising a new commission split arrangement. The new commission split arrangement is specifically aimed to incentivise growth. As the CEO states, "these new commission plans ... can really incent them to shoot for a lot of growth and we'll pay them for a lot of growth, but only for lot of growth." Although they cannot give away too much information on this, the new structure certainly sounds like it could realign the relationship to make it more mutually beneficial. The firms strategy for their battle against lower volumes, higher agency costs and increased competition mostly lies with this strategy for increasing their agent growth and productivity. More agents means more transactions to offset depressed volumes and commission costs. By attracting more agents orientated towards innovative growth, the firm hopes to create avenues to protect itself from disruptive competitors. Industry dynamics are ever changing, in terms of the platforms used to transact and those transacting. We believe that RLGY would benefit by employing a focus on the younger generations when devising their strategies. Since 2017, more loan mortgages have been purchased by millennials than any other group and 2020 is expected to be the peak millennials home buying year. According to data from realtor.com, millennials account for 45% of mortgages, compared to 37% of Generation-X and 17% of Baby Boomers. This can be achieved through a mixture of targeted sales and marketing efforts and by developing more consumer facing tech-based solutions for easing the transaction process (zillow, iBuyer). Although management did not go into too much detail on this, we expect (due to their comments/secrecy on the new commission structure) that they are in the process of forming a partnership or developing a product to help gain more business from this segment. 2019 will be a difficult year for the company with these headwinds and the execution of their initiatives, however we believe that the market was overly pessimistic following the Q4 announcement, a judgment shared by Compass Point who recently upgraded RLGY. The firm is expecting lower growth in commission costs in 2019 (111bps vs 180bps). The lower mortgage rates and falling house prices are increasing affordability, this in tandem with rising inventory could mean less pressure on transaction volumes than was expected towards the beginning of the year. We are expecting Q1 results to be slightly more favourable than the prior quarters guidance would have us believe. The primary item we'll be looking for regards their ability to attract more agents to drive growth. If the firm can show significant growth in agents offsetting increased commission costs and lower volumes, there may well be cause for investors to re-evaluate this stock at a higher price.